I've been working on the kids' new slopers (and some for other adults) this month, which translates to actual but excruciatingly slow garment production. I don't mind - in the process, I am remembering a lot of old stuff that I used to know as a very young person sewing under mum's tutelage. Some of this old stuff is just dumb arguments I used to have with mum that make me smile now that I am (ahem) slightly less idiotic and stubborn. Not worth boring you with those, eh? But some of the old stuff is extremely useful to me now that I am sewing on my own, so I thought I'd share. Hence the previous post on How I Mark Sewing Points on Fabric. 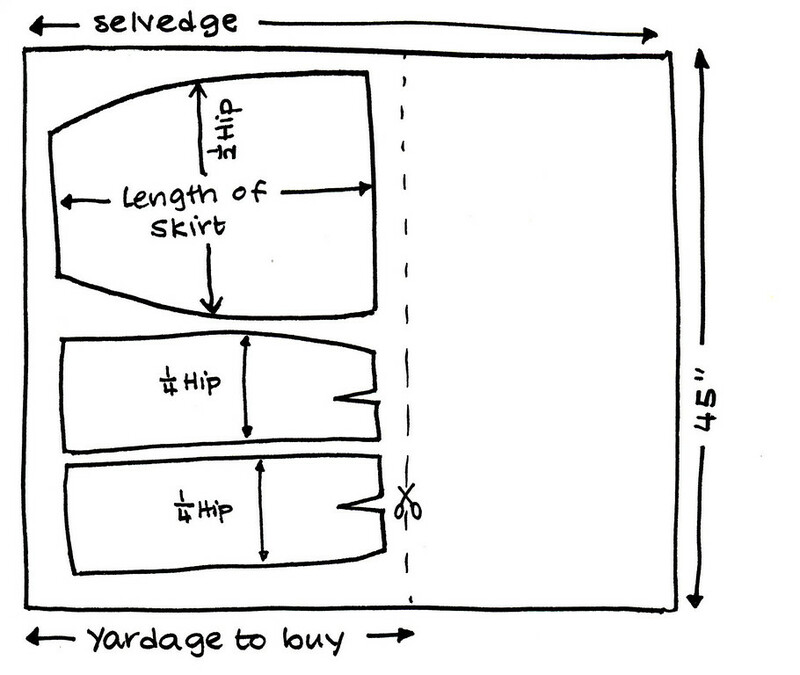 Here's another one: How I estimate yardage for garments. A person might ask fabric store staff, which I sometimes do. So naive. That has not proven helpful. Or a person could just buy 5 yards to be sure there'd be enough fabric for the garment, some mistakes, and general mass-production. But fabric is expensive, and sometimes a person would like just enough and have money left over for nutella other fabric. Or a person could buy one of those handy miracle yardage charts and little pocket flipbooks that tell you how much fabric you need in different widths for different garments but I don't want to always have that in my purse. I mean, what with the multiple measuring tapes, vast quantities of candy, a leaky sippy cup, scrunched up coupons, linty tissue paper balls and whatnot, there is just no room. Me: Hey ma, how much do I need for a skirt? Mum: What kind of skirt? Me: Er, dunno. Maybe A-line. Maybe straight, pencil-ish. Mum: How wide is this fabric? Me: Erm (staring at the bolt)........ 45". Mum (staring at my lower body and calculating in her head): Buy the length. Similarly, fabric stores in Singapore in the old days were staffed by people who could actually estimate yardage. The cutting counter ladies in Spotlight (circa 1990) all sewed clothes, and whenever I broached the yardage question, would scrutinize my person and then bark out some value. Quite accurately, in fact. They never asked my age or dress size or consulted a pattern packet. And mum would concur with them, saying, "Yes, that's what I thought. Maybe buy an extra half yard in case you make mistakes." I decided then that the older generation of sewists were venerable, magic people whom I could never hope to emulate. 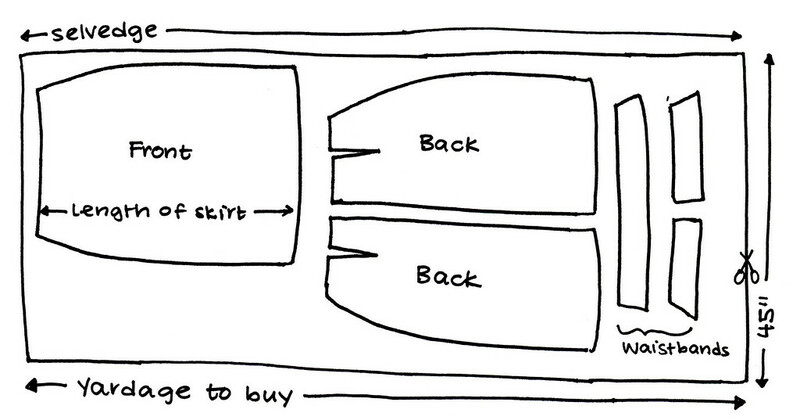 Mum eventually explained to me what this mysterious "Buy The Length" rule was. There were exceptions, of course, but it was a very good starting point, particularly when I am lucky enough to be out shopping and unplanningly see fabric from which I immediately have a garment in mind to sew. First, let's visualize the layout of a pattern on fabric - with the pattern pieces in full-width rather than folded half-width. Typically, the pattern pieces are laid parallel to the selvedge of the fabric, so that the stretch/give (if present) is sideways. This is because movement of the body when wearing the garment is usually in the sideways direction (breathing, stretching, overeating etc) rather than in the head-to-toe direction. 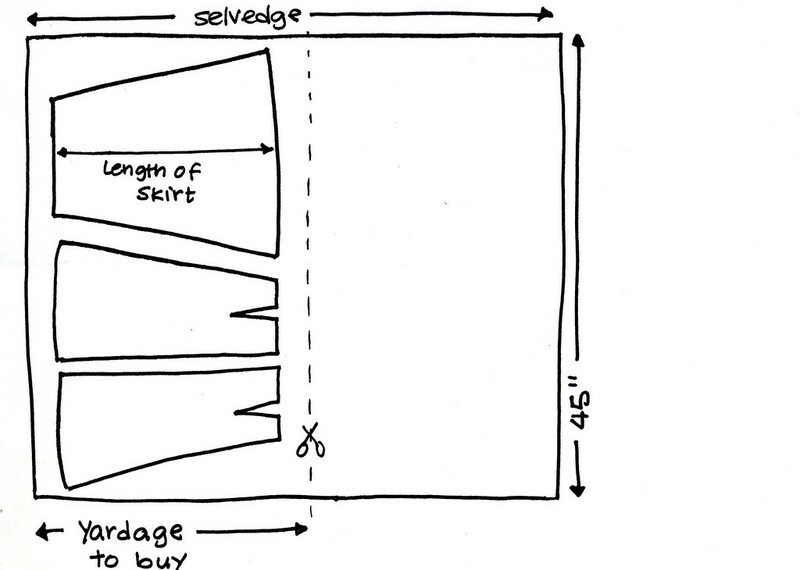 The widest part of such a skirt pattern is the hip. So if you add up the total widest parts of the three skirt pattern pieces, this would be approximately 1/2 Hip + 1/4 Hip + 1/4 Hip = 1 whole HIP. The widest part of the blouse pattern is either the bust or the hip, depending on the individual. Using the same fancy math formula as for the skirt above, the total widest parts of the pattern are therefore approximately one full BUST or one whole HIP. the total widest part of the pattern is much less than the width (usually 45") of the fabric. This is often the case for children's patterns, which are smallish. if the fabric has no nap or one-directional print, so that you can lay one pattern piece upside down with respect to the other pattern piece. If these two assumptions are true for your pattern, then visually you can lay out the front and back parts side by side within the width of the fabric as shown in the pictures above. Don't forget seam allowances! if your bust measurement is much less than the 45" width, and your sleeveless blouse pattern from shoulder to hem is, say, 24" , then buy that length i.e. round it up to 27" = 3/4 of a yard (sleeves are extra, but we'll talk about that later). if your hip is much less than the 45" width and you are making a pencil skirt that's, say, 20" long, buy that length i.e. rounded up to 3/4 of a yard. if you are making a sleeveless sheath dress, and your bust/hip (whichever is larger) is less than 45", and your sheath dress is, say, 50" long, buy that length i.e. rounded up to 1.5 yards. if you are making an A-line skirt (or dress), whose flared hem is much wider than your hip, then the hem, and not your hip, is the widest part of the pattern, and you will need to measure the actual pattern to be sure the pieces will fit side-by-side as shown in the picture below. if you are sewing for children, whose chest, hip and hem measurements are almost guaranteed to be much, much less than 45", buy the yardage equal to just whatever length that garment is. 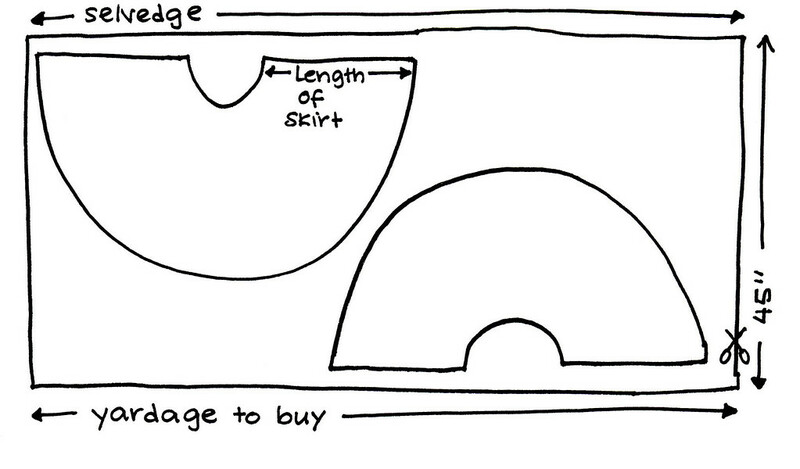 In other words, "buy the length" of your garment. See? Q: How do you know how long your pattern is? A: Whip out your measuring tape and measure yourself. Yes, even in the fabric store. Measure from your shoulder to the desired hem of the blouse, or from your waist to your knee for that skirt, or from your shoulder to the hem of that dress. Q: What if there are sleeves? And a waistband for the skirt? And pocket facings? And other features? A: Visualize the layout in your head. Remember that all the pieces stretch sideways, so they must be laid out parallel to the selvedge. 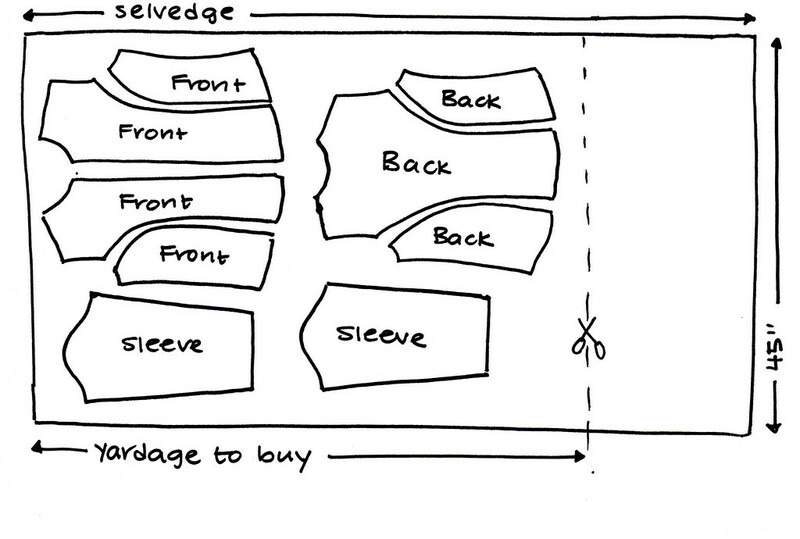 If you are adding sleeves, measure along your arm - a short sleeve about 7" from the shoulder? Add an extra 1/4 yard. Long sleeves to the wrist - 20"? Add an extra 3/4 yard. Q: What if the fabric has a nap (pile of the fiber, like corduroy or velvet)? Or a print that has definite right-side up and upside down directions? Or if the widest part of my pattern is so wide that I can't fit the front and back pieces side by side? 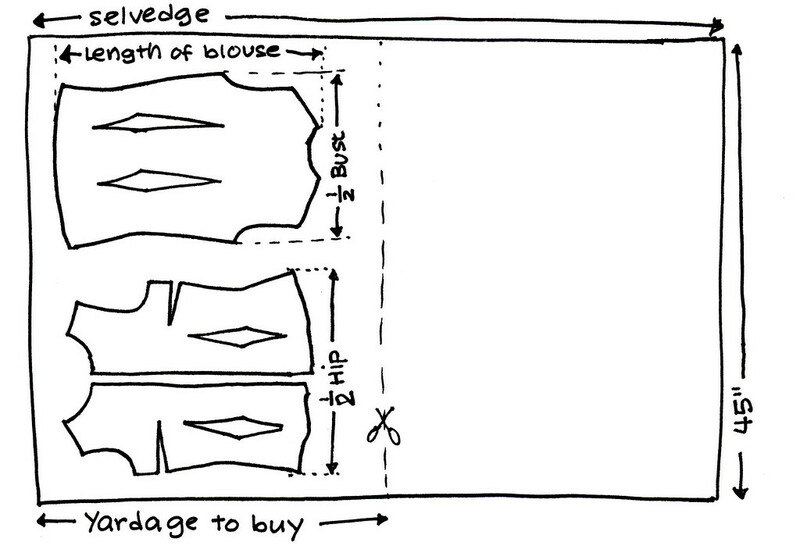 in which case you will need to buy 2x the length of your pattern. BUT you might be able to use the extra leftover side bits of fabric for things like sleeves and collars and pockets as shown above, without having to buy extra yardage for them. Whee! Q: What if the fabric has a dual-directional pattern that I want to be sure meets neatly at the seams, like stripes or checks? A: Depends on how small or large the repeat print is. If it is tiny like gingham checks or narrow shirt stripes, it won't affect the yardage. If you're worried about it, add an extra 1/4 yard to be safe and if it isn't horribly expensive fabric. If the repeat print is large/far apart, add more, like a 1/2 yard. Q: What if I am laying my pattern pieces cross-wise i.e. along the bias? A: Ah, then your guess is as good as anyone's. Remember how I hopefully asked the cutting staff at Joann how much I needed for my bias-cut blouse with short sleeves? She didn't know, and neither did I. I estimated a yard and a half for my pattern which was 24" long and it was perfect. But it was a lucky guess more than skilled estimation, since I don't sew bias-cut garments as often as I'd like to. See the sketch above - you'll need more than 1x length but not quite 2x the length since the pattern is not laid out quite end-to-end. 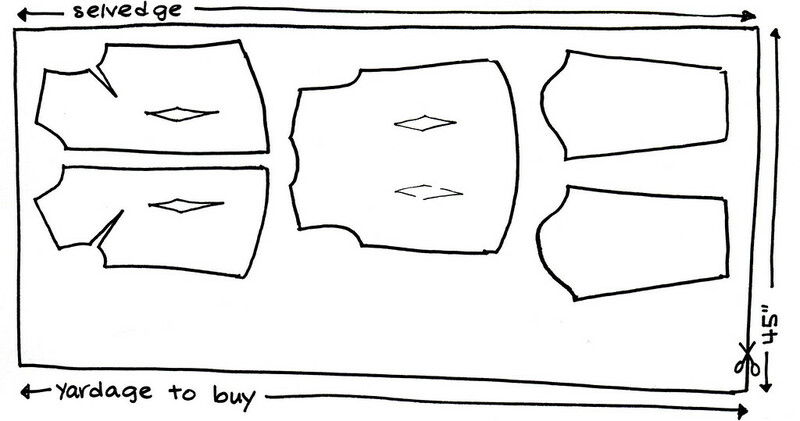 I'd say buy at least 1.5 times what you'd usually need for a regular-along-the-grain-layout garment. 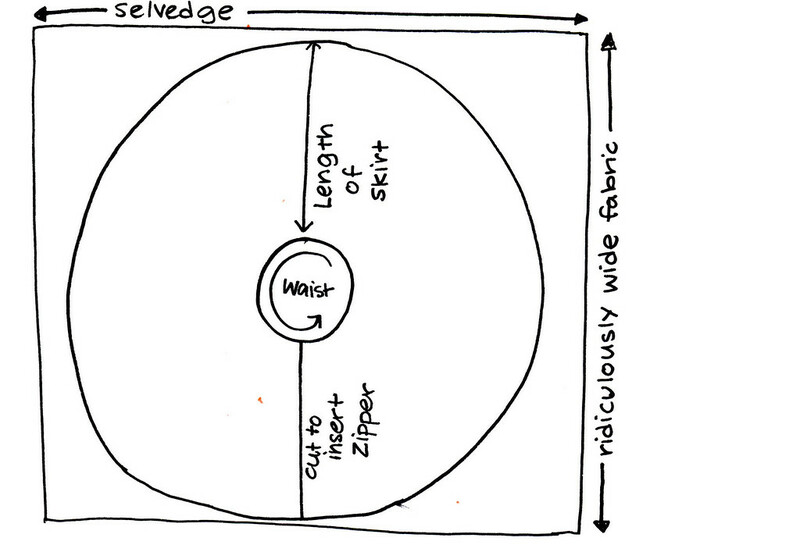 Q: What about circular (and partial-circular) skirts? 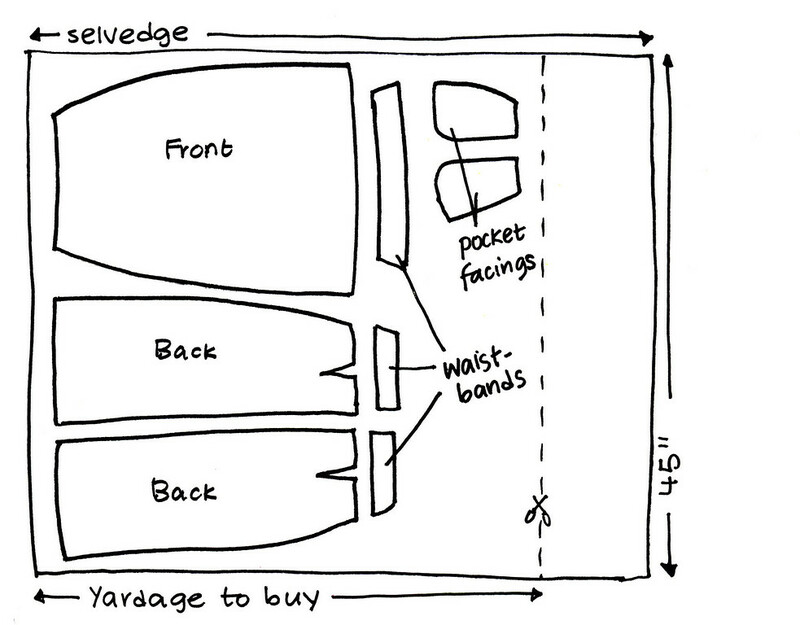 and buy the yardage equivalent to 4x the length of your skirt, plus extra for the diameter of those waist semi-circles. Good news, though: if it's for your kid, you might be able to get a full, uncut donut from a 45" fabric, again depending on how long the skirt is. Remember that there is that waist circle's diameter you'll need to add in, so unless you're a Math whiz, it's probably best to bring your donut paper pattern itself to the fabric store to test it out. Or measure it at home and write the answer on your arm. There is no shame in this, friends. People (especially those with children) who frequent fabric stores all have questionable sanity, so we won't bat an eyelid if we see you do this. I love you! Please come and live in my house, or maybe my street, I'll even let you live in my town as long as I can absorb all your dressmaking knowledge!! I need a person like you in real life to help me with these things. I was considering doing a dressmaking course but I really don't think they are gonna give me as much knowledge as you and other bloggers can. Thank you and keep up the lessons, loved the one on pattern marking yesterday. I'm off to look at properties close by me ready for your move...... how many bedrooms do you need? And of course a sewing room!!!!!!!!!! A very cool and informative post! Great stuff! Thank you very much for this post, very informative. Especially the part about giving your kids candy in the fabric store...my kids usually pay hide-and-seek in the fabric store which results in me looking for them while looking for fabric. Seriously, I wish that I could just hang around for a few days and watch you sew. I would learn so much. Thank you for this wonderfully informative post. Thank you so much for sharing this information. I love how you added the drawings. I'm very visual and that helped me further understand it. I do use commercial patterns, although I'm very very fascinated by your method. So this is a brilliant post, one that I'll have to read a couple times as I keep sewing until I get what you're saying. I like learning more, and I know that you have lots to teach me. Thanks for this post. What a great post! Most people do not have a clue how to do this. You just saved me a TON of time, because I am now going to set up a link on my blog to this great post instead of trying to write one about this topic myself! Thanks! I almost always buy in full yard increments, and try to overestimate. I have found many, many times that I wished I had more of the fabric (usually for a quilt or child's garment) but funny, I've rarely thought "Man! I wish I had LESS of this one!" LiEr! Remember when you posted that link to the rules of sewing? One of them was about how you shouldn't use quilting fabric to make clothing. Oh. My. Goodness. I had been doing that (shame on me!) and I just never knew that there was a difference. When I go to a craft store, my eyes glaze over looking at the apparel side of the aisle. Granted, my local store is quite small, so it's hard to find something suitable. At the time, I also got some thermal fabric for pjs. This time, I'm looking at cotton knits. What's funny is that I know what to do with them, so why wasn't I using them before? Most helpful sewing tip I have seen...thank you!!! Someone somewhere else on the internet (or maybe in the Threads letters column...) has subtly marked 36", 45", 54", 60" on her ?cutting table?, ?dining room carpet? so that after she has a drafted pattern she can lay out the pieces very carefully and know how much of the expensive cloth to buy. Not the same problem, but related! 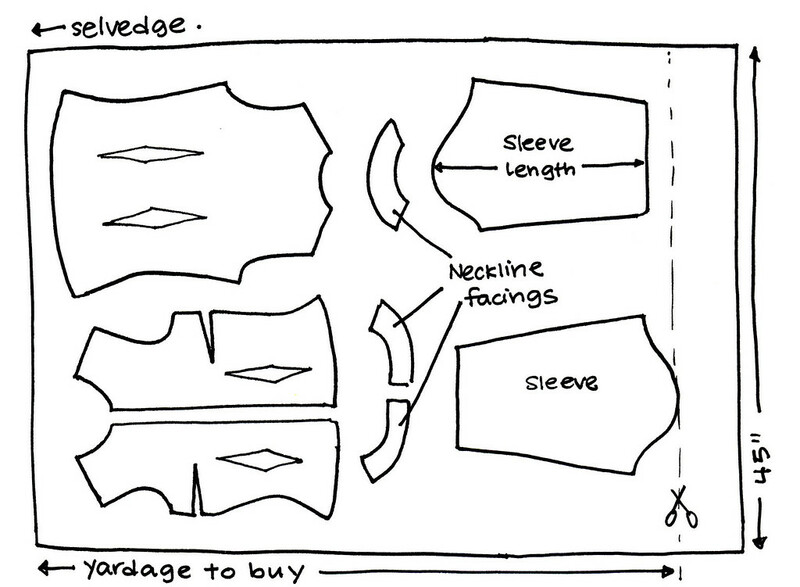 I wish you would write a Tutorial series about drafting a women´s sloper sometime, too. HI...My mother who sewed all my cloth since I was a child, used to take me with her to purchase material for most projects. She would always do exactly what you mentioned, measure me around my hips and "buy the length" if i fit within the with. However, as I started getting older and gaining weight we would always look for 60" material so we could still "buy the length". Either that or then she'd say "we have to buy double because it's 45" only". I never really took up sewing completely, but I just had a little granddaughter and figured I could make her a few things. So I have been searching the internet for information on how to make my own patters since I always heard my mother's regret in not having learned to do that. When I came across this post and started reading I realized I already knew this part. Somehow in all the trips to the fabric store with my mother I had learned this part and probably much more that I may not even realize that I know. This article transported me back to all those fabric store visits and made me realize how much I learned from my mother by just going along with her. I read the end of the articles with blinding tears. I wish she was still here.....Thanks for bringing back such sweet memories. Amazing how mother's comments/informal lessons come back to us isn't it!? I always marveled how my mother knew these things! She always felt that the patterns were wasteful and would use the best layout, ignoring the directions. I have finally figured out why for years I hated laying out patterns - as a kid I thought this process was painful!!! Oh my heck! I love you! I came up with the ridiculous idea that I (a homeschooling mother of 4 girls, who has ADD, and watches neighbor kids during the day) could create a unique fairy tale inspired dress for each of my 4 girls (born ridiculously close together) that we designed together on paper. Then I realized that I had NO idea how to transfer the designs from the paper to reality. My most pressing question was "How do I know how much fabric to buy if I make up the pattern?" Thank you for demystifying (is that a word?) the process and being hilarious at the same time! Thank you so much for this tutorial-I still need a calculator. Thank you so much! You saved my bacon in the nick of time! As a new sewer I have bookmarked your site. What a great resource! Like you and others I have been transported back to my childhood and my mother's wisdom of how much yardage to purchase. As an adult and apprentice upholsterer I marveled at the ability to look at a chair and accurately know the yardage. In time I was also able to do that - in retirement it feels like a curse!! The lesson I was taught was to do cut diagrams (endlessly it seemed when sent back to do multiple versions to get the most economical considering pattern matching, bias, etc. but is sure was a helpful tool! Now I love doing a cut diagram - it was wonderful to see yours. Thanks for this, my takeaway is that clothing is just like a chair!! You have taken away the uncertainy for me - again thanks! Doris: I can only begin to imagine what a furniture cut diagram might look like! Thank you for sharing this - always blows my mind to see yet another application of some foundational concept I learned as a (reluctant) child. Ah, the blessing of hindsight.